My dream was to be a jazz musician, unfortunately all that amazing improvisation will never be realised on my guitar – but in the kitchen I’m an old hand! I reckon by the time your 40 the one basic skill you should have acquired via osmosis is how to improvise while cooking. 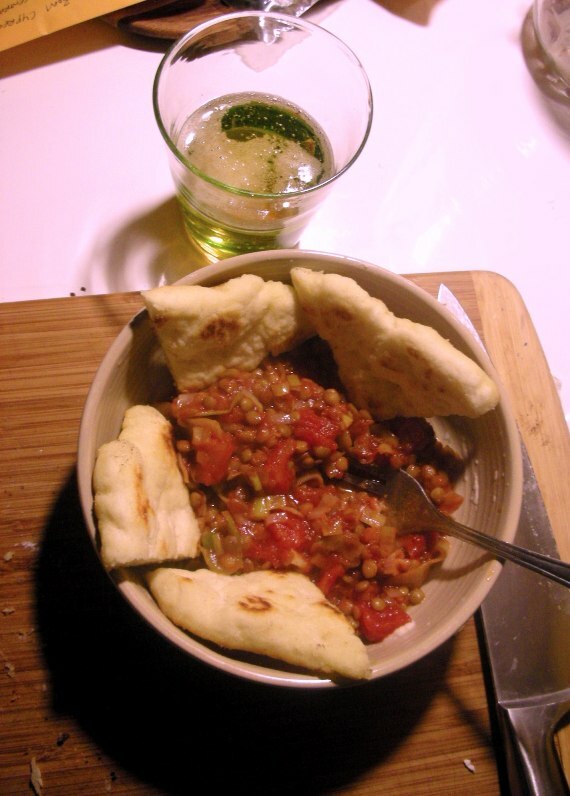 This weeks winner of a dinner for one was Tomatoey Leek and Lentil stew with a side of home made salty flat bread. In a pot fry up leek and garlic, allspice and vege stock n olive oil til soft, add lentils and simmer for a minute or three. Add tomato pop the lid on and cook on very low for about 10 minutes. Serve in bowl with quartered flat bread. throw 2 Tbl spoons of self-raise flower in a flat bowl with a pinch of salt and water until you have a gooey sticky blob. Add more flour while kneading into a not so sticky fluffy dough. Flatten out in the bowl like a tiny pizza base. Heat in a small fry pan some olive oil and more salt. Cook flattened dough in pan until light brown – both sides. Cut into 4 and serve hot. ← Whats been happening at Intueri Farm? – an update. Wow. Thanks for sharing the recipe. Any leftovers? I’ll be right over.